"With Windows Phone 7, Microsoft has created a completely new smartphone operating system that focuses on allowing users to be productive with their smartphone in new ways, while offering seamless integration and use of Microsoft Office Mobile as well as other productivity apps available in the Microsoft App Store. Windows Phone 7 Made Simple offers a clear, visual, step-by-step approach to using your Windows Phone 7 smartphone, no matter what the manufacturer. Author Jon Westfall is an expert in mobile devices, recognized by Microsoft as a Most Valuable Professional (MVP) with experience teaching both businesses and consumers. This book will get you started with the basics and then teach you tricks and shortcuts that will save you time and help you maximize your productivity." 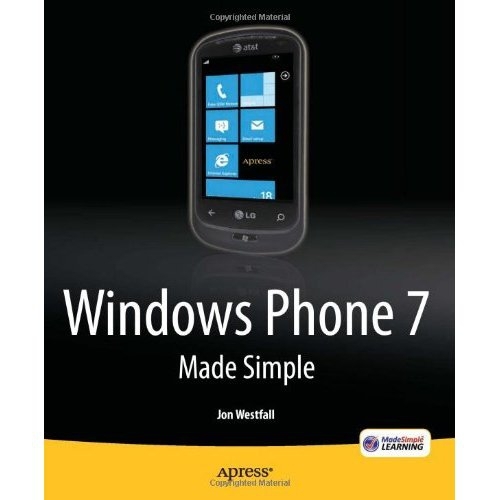 Long-time Windows Phone Thoughts contributor Jon Westfall has just had his first book published, Windows Phone 7 Made Simple, so please join me in congratulating him on this! Having had a couple of books published myself years ago, the feeling of achievement is wonderful. If you're looking to understand the in's and out's of Windows Phone 7, be sure to check out Jon's book. It's very visual, with hundreds of screen shots, so if you or someone you know wants to dive into learning Microsoft's new operating system, be sure to check this book out. Congrats, Jon! Next round's on me!